Animal con artists are so sophisticated that they make us look like amateurs. Mimicry – in appearance, scent, sound and behavior (for instance a harmless red milk snake will change its colors to look like a venomous coral snake), camouflage, feigning death or injury, adopting threatening poses, verbal and tactical deception and straight out lying are some of the tricks they use to get food, save themselves or win contests. Some harmless species imitate poisonous species. Some change their behavior so that the prey is lured in. A parent bird will feign a broken wing to attract a predator away from its defenseless offspring. Some moths use an effective stratagem against bats. When they hear the ultrasound emitted by hunting bats, they produce loud clicks to mimic the unpalatable Tiger moth so that they are not targeted. The “two-headed” snake of Central Africa has a tail that resembles a head and a head that resembles a tail. The snake even moves its tail in the way most snakes move their heads. This confuses the prey as to where the attack is originating from. So many animals change their coloring to become invisible in their surroundings. Uroplatus geckos can become completely invisible. Katydids can change their body coloring and shape to match entire leaves, half-eaten leaves, dying leaves, leaves with bird droppings, sticks, twigs, and tree bark. 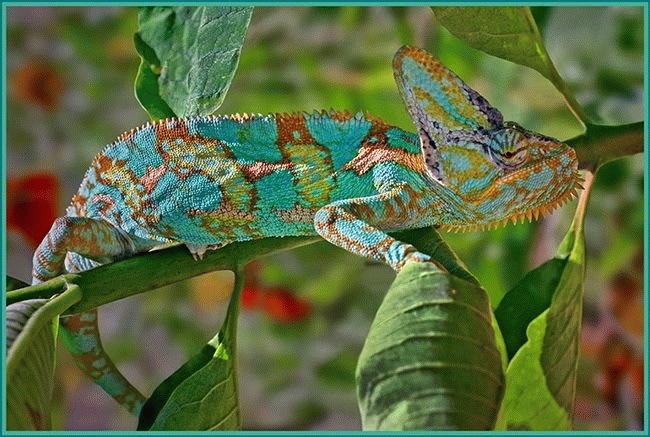 Different chameleon species are able to change colors which include pink, blue, red, orange, green, black, brown, light blue, yellow, turquoise and purple. Some octopuses can use muscles in the skin to change both colour and texture taking on the spiky appearance of seaweed, or the scraggly, bumpy texture of a rock among other disguises. The mimic octopus combines its highly flexible body with its colour-changing ability to look like more dangerous animals such as lionfish, sea snakes and eels. A wide range of animals, lizards, birds, rodents, beetles and sharks, will pretend to be dead, to avoid being killed, as predators will usually take only live prey. The male nursery web spider feigns death to avoid getting eaten by females during mating. Some appear more threatening than they actually are. Mantis shrimps have front limbs known as smashers to attack. Baby mantis shrimps bluff by spreading their front limbs, even though their still-soft bodies mean that they cannot use their smashers without damaging themselves Cuttlefish are amazing. They are able to simultaneously communicate two entirely different displays to two different observers. When a male cuttlefish courts a female in the presence of other males, he displays two different sides: a male pattern facing the female (courtship), and a female pattern facing away, to deceive other males. Female marsh harrier courted a male to obtain access to food he had stored. She then took this food and fed it to chicks which had been fathered by another male. Ravens hide their food in caches. But if they feel they have been spied on, they frequently change cache sites, or recover their food items. Apes are masters in tactical deception. A well-known example involves a chimpanzee that was approached from behind by a loud aggressive rival. The chimpanzee manipulated his lips several times before losing his fear grin and only after he had done so, he turned around to face the challenger, concealing his fearful expression. In another experiment food was hidden and only one individual, named Belle, in a group of chimpanzees, was informed of the location. Belle was eager to lead the group to the food but when one chimpanzee, named Rock, began to refuse to share the food, Belle changed her behaviour. She began to sit on the food until Rock was far away, and then she would uncover it quickly and eat it. In an attempt to speed the process up, Rock looked away until Belle began to run for the food. On several occasions he would even walk away, acting disinterested, and then suddenly spin around and run towards Belle just as she uncovered the food. Baboons use an exaggerated “looking” gesture which means the detection of a predator, to avoid attack by an adult male. Junior Tufted Capuchins employ a vocal form of tactical deception when competing with dominant monkeys over valuable food resources. They will use alarm calls normally reserved for predator sightings to make the rest run away and then take advantage of the distraction to pilfer food. The Alcon Blue butterfly caterpillar drops to the ground and emits a scent that fools Myrmica ants into believing that she is one of their own – only just a little bigger. They take her into their nest and feed and take care of her as if she is a queen. As soon as the caterpillar changes into a butterfly she escapes the nest before she is attacked. There are Australian spiders that smell and behave like ants: some are so convincing that the ants will allow a spider to live permanently as one of them. This spider will then feast upon its new friends, but it won’t eat all the ants, or even a significant number; instead, it extracts resources slowly, sustainably, and over time. The Giant Geometer Moth Caterpillars take camouflage to the next level, incorporating elements of whatever plant they’re eating, into their bodies – and end up smelling like the stick. This strategy fools hungry ants who march all over the moth larvae. If the same caterpillars are put onto a plant they have not sampled, the ants attack. The harlequin filefish lives among coral reefs in the Indian Ocean. The fish fends off potential predators by eating – and smelling – like the Acropora coral it calls home. Coral-dwelling crabs or predatory cods can’t tell the difference between the smell of the coral eating filefish and the coral itself. But it’s not just about avoiding being eaten. Some sneaky moths, like male Asian Corn Borers, imitate bat sounds to make females freeze in fear, then take the opportunity to mate with them. These males are not good at copulation so they use this trick to improve their odds. Male yellow peach moths do even better. They use a similar sonic hoax to scare away rivals when they are in pursuit of a female.